Beautiful pictures of Lilly at peace. Beautiful Mandala and it looks like the ceremony was quite meaningful to Lilly. Yes, I agree. 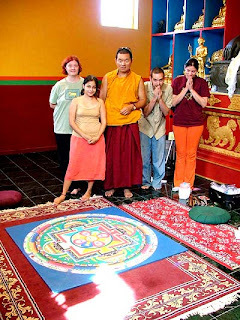 She helped to create the sand mandala! She loved dharma and meditation practice. 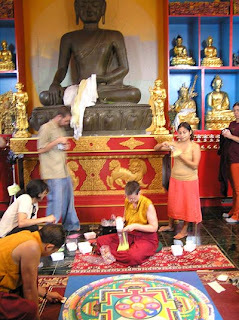 I’m so glad I finally found these pictures on the Kagyu Center’s website. I’m trying to get in contact with the nun who’s in charge of the center. She knows Lilly quite well. However, she is on a meditation retreat. Hopefully, I’ll hear back soon. Lilly looks so peaceful, almost like she knew she was about to bring to this earth such a precious gift as Palden. Lilly, all your efforts have not gone unnoticed, thank you for showing such love to our world, thank you for believing in goodness in each soul, you matter Lilly…we will make sure Palden knows how very much you do.